As you are looking for the best self cleaning cat litter box for your feline companion, you’ll notice how many features that manufacturers include with their products. That in itself can make you frustrated when determining what you’ll buy. We appreciate how hard that can be. Waste storage – automated systems need room for holding materials until you can empty them. Odor control – Manufacturers may include elements that assist in keeping smells down. Another consideration that many owners do not take into account is getting their pet acclimated with automated crates, so it is critical they are comfortable so they can relieve themselves. How Does a Self-Cleaning Cat Litter Box Work? Automated – will sense when your feline friend finishes their bathroom business and moves away. Sensors, along with timers, activate a motor with a rake connected onto it. Its rake combs through the box, removing unwanted material into a side-storage area. Manual – must be monitored by you. Once wastes have been spotted, you will need to physically tilt or rotate the box. This separates good from used materials, with any unwanted wastes being removed by you. Which self cleaning litter box is the best? Your electric cat box will prove frustrating when you’re operating or cat’s using unless it performs as needed. Which features are important for these self-cleaning toilet crates? First off, your potential selection needs to be easy for your furry friend to use. Secondly, that won’t mean much if it’s too complicated for you to clean. Any design elements that make it over-complex might cause concern. Your automated litter box selection needs to not only be accessible but it must also provide enough room for your pet to use it. That will include their ability to climb into it. The crate must also fit into your desired location. Proper locations are important as they need to provide privacy as well as security. Improper size and location are two factors that can negatively influence your kitten’s use of their toilet. Automatic litter products use a rake to remove unwanted material from its substrate. Mechanical litter box equipment requires you to manually assist in removing waste. 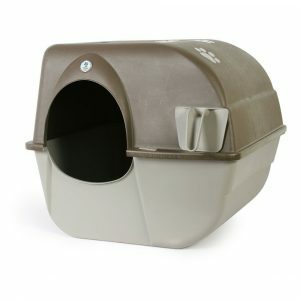 The best self sifting litter box equipment has safety features that prevent them from turning on when your cat is in it. Manufacturers may suggest these products work best with clumping substrates, as do mechanical cat litter box designs. Automatic add-ons for odor control, debris storage, and waste removal add to its convenience. Most automatic litter box cleaner builds draw power from your household’s wall outlets. Some products run on batteries alone. 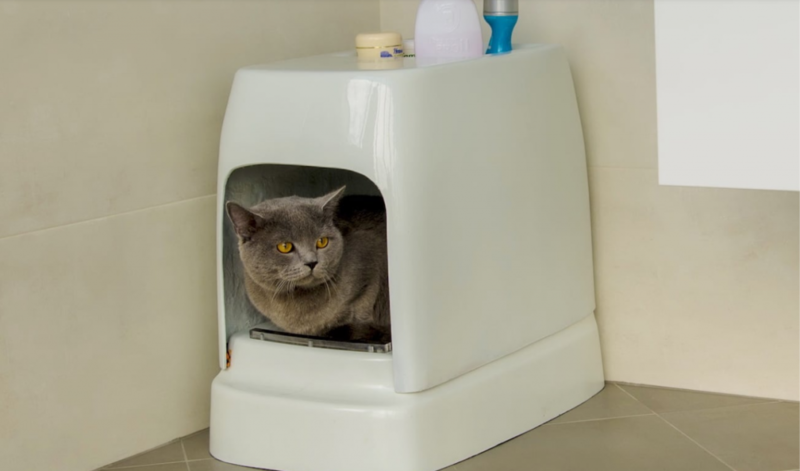 There are smart litter box designs that draw their power from outlets while including battery power as their backup energy source. With the seemingly endless choices available to you on the market, it might be hard to determine which product is the best self cleaning cat litter box out there. Our table highlights products that we consider worthwhile for review and each is examined more closely below. Every entry has been written in a similar way so that you’ll be able to compare each side-by-side as you read. We not only touch upon what’s best, but we also look at what isn’t. You may love your cat, but no one loves cleaning the litter box. One of these 9 best self-cleaning cat litter boxes maybe what you need to make your life easier. Clumping litter, introduced in 1996, paved the way for the invention of automatic cleaners. Designs have proliferated, and today you can find auto-scoopers, auto-combers, conveyor belts, and more. Early models had problems, but manufacturers improved and refined their products. Following a maintenance schedule, and product instructions should alleviate most problems. We looked at the size, performance mechanism, and power source for each as well as the key features that got it on our list. What if you could just roll your litter box on its side then back upright and it magically cleaned itself? The Omega Paw self-cleaning litter box does just that. It resembles the usual hooded ones, but its cleverly engineered 3-step process screens out the waste, and deposits it in a pull-out drawer ready for disposal. Early versions were a little flimsy, but the company listened to consumer complaints and beefed up the plastic and improved the latches. Users either love this one or hate it, but the love far outweighs the hate. It does not require electricity or liners. It is well suited to a single smaller cat. There is no ongoing expense other than litter. It requires a large amount of space. The latches can loosen, and litter may leak out during cleaning. The useful inside area is a little crowded for a large cat. If you have a small cat and the room for this rather large unit, including space to roll it, this is a good choice. Would you prefer hands-free continual cleaning? The PetSafe Simply Clean has a large rotating bowl that makes one revolution per hour. Waste is pushed onto a conveyor belt and deposited in a bin which you can line with recycled grocery bags. The design accommodates cats who weigh less than 15 lbs. It is quiet and inexpensive to run. Like most self-cleaning units, this one works best with the correct litter. In this case, that is a lightweight, high-quality, clumping clay, with gravel size neither too big nor too fine. There is a fill line on the bowl. The complaints users have with this unit jamming or clogging, are likely due to overfilling, underfilling, or using the wrong product. Because it runs continuously, the small motor will, eventually, burnout, but replacement motors are inexpensive. It will not accommodate cats over 15 lbs. It is finicky about the litter. Most users give this unit a positive rating. 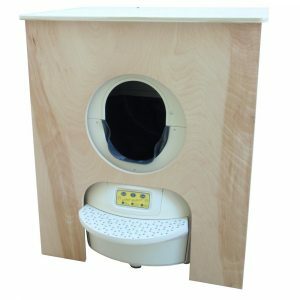 If you use the right litter, have a cat who is under 15 lbs., and periodically wash out the tray, this unit is an excellent choice. Do you have more than one cat? 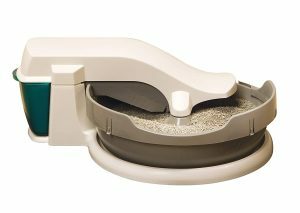 Consider the LitterMaid Automatic Multi-Cat Litter Box. It is well-constructed, sturdy, and can go up to a week before you need to empty it. Smart motion-detection sensors recognize when the cat enters and leaves. Ten minutes later a rake collects the clumps and scoops them into the disposable receptacle. To reduce garbage and save money, instead of purchasing the replacement waste receptacles, you can use a plastic grocery bag to line the container and reuse it. It is well-built and long-lasting. A paw cleaning ramp traps litter and keeps it from being tracked around the house. The charcoal filter in the waste receptacle helps neutralize and control odor even for a multi-cat home. There is a battery back-up in case of a power outage. If the litter is too deep in the pan, it can spill over the sides during cleaning. It does not come with a hood. It still has some odor. 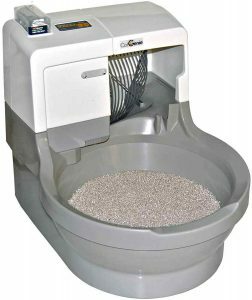 The LitterMaid is one of the more popular self-cleaning litter boxes. Never want to see cat waste again? 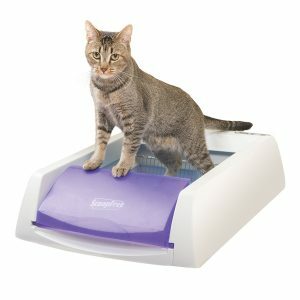 The PetSafe ScoopFree Ultra hooded, rake style automatic litter box uses disposable trays and special crystal litter that absorb urine and moisture from solids. It can go weeks without changing, and when it is due, just put the lid on the disposable tray and dump it all in the garbage: no muss, no fuss. The cleaning cycle commences 20 minutes after use to give the crystals time to absorb the moisture. Many users recommend buying the ” forever tray” rather than relying on disposable trays that are expensive and sometimes leak. Some cats do not like non-clumping crystals, so it is advisable to test yours to see if he will accept or reject it. Some people have tried regular non-clumping litter with success. · Disposable trays are quick and easy to change. Because the crystals absorb moisture, there is good odor control. The crystal litter is low tracking. The counter helps you gauge your cat’s health and track when to replace the tray. It is roomier than the original version. · Disposable trays can leak and are expensive. It is loud during the cleaning cycle. Overall this litterbox is well-liked and performed as expected with minimum work. 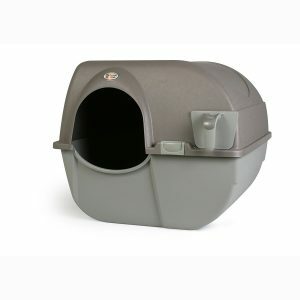 For a little more money than the PetSafe ScoopFree Original, the Ultra version provides more room, a privacy hood, a health counter, and adjustable rake delay. Do you like the idea of a manual box but have a large cat? 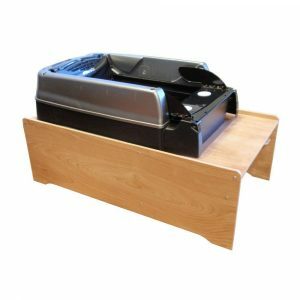 As with the regular size, you manually roll the Large Omega Paw Self-Cleaning box to the side then back upright to collect litter in the removable drawer. It takes up more room than the regular Omega Paw, but the increased size affords cats more space and comfort. It works best with lightweight, hard-clumping litter. Easy to use manual operation. Except for litter, there are no ongoing expenses. The roomy size accommodates large cats. It is large and requires a lot of space to operate. If latches loosen litter can leak out during cleaning. If you are looking for an easy method for cleaning a cat box, this is it. It receives overwhelmingly positive ratings from users. Have you tried and failed at teaching your cat to use the toilet? 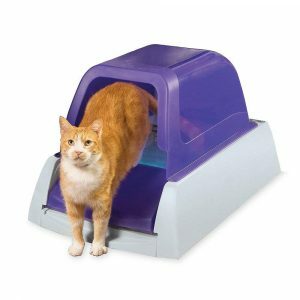 Get your cat his own toilet with the CatGenie Self Washing Self Flushing Cat Box. Just connect it to cold water source, run a hose for waste to a drain or toilet, plug it in and you’re ready to go. In place of litter, the CatGenie employs washable granules. The full flush cycle takes 37 minutes, and while shorter cycles are available, you will have the best results running the complete cycle. The unit can be set to wash every time the cat uses it or at preset times. In a multi-cat home timing of the flushing may be a problem as the unit is not usable when filled with water. With multiple cats, you need to set a timer to schedule the flushes, or it could be flushing almost constantly. The biggest complaint is ” baked poop” which occurs when the solid waste is not entirely washed away and gets heated during the dry cycle. This seems to happen more often if you run short cycles. The washable granules get spread around as most litter does. A litter matt helps reduce this. You never need to touch litter again. It is well-made and durable. Waste is flushed away, no need for bags or receptacles. Because it involves water, there is the potential for leaks. It is wise to place a shallow pan underneath as you would for a washing machine. At 37 minutes, it has a long wash cycle. The majority of users rate the CatGenie highly and describe it as low maintenance. It is necessary to follow the suggested schedules for optimal functioning. If your cat prefers privacy, hoods are available. While this is one of the pricier units, most users feel the quality and performance warrant it. This is not a self-cleaning system, but an add-on chute that funnels waste into a large collection bag under the unit. This greatly increases the capacity for collection and reduces the number of times you have to empty it. It is compatible with all LitterMaid models including LM980 and all Elite, and there is a version for the ScoopFree model as well. This accessory works well in reducing the number of times waste must be disposed of. The special bags are on the expensive side and had issues with sealing tightly for some people, but most people easily found workarounds for both these problems. The large capacity means fewer trips out to the trash. It replaces the need to buy LitterMaid receptacles. The platform raises the unit 18 inches off the floor, and it may be too high for elderly cats. You can solve this by adding a ramp. The wood is unfinished, but you can easily paint or stain it if desired. 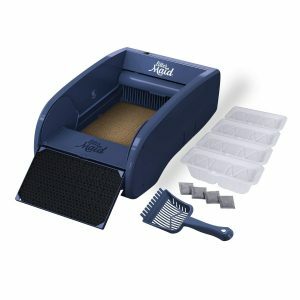 If you have a LitterMaid automatic litterbox and multiple cats, and you hate messing with cat litter, this accessory will reduce your work and aggravation even further. Most users give it a 5-star rating; you probably will too. The PetSafe ScoopFree Original, like the Ultra, will spare you handling litter. It uses the disposable trays, and the special crystal can go weeks without changing. When it is time to change it, put the lid on and dump it in the garbage. The cleaning cycle starts 20 minutes after the cat exits. The Original does not keep track of your cat’s “business” with a counter as the Ultra does, this can be a drawback. Disposable trays are quick and easy to change. Disposable trays can leak and are expensive. It may be too small for larger cats. If you want to save a little money, and don’t care to know how often your cat uses the box, this may be the unit for you. If you’re fond of the space-age look, you’ll appreciate the design of this box, although it is far from boxy. The Little Robot 3 looks like a gigantic egg. This battery-run model senses your cat, and 7 minutes after she leaves, the unit rotates sifting out the solids and dumping them into a carbon-filtered waste drawer. This is the most expensive unit we looked at. With the Litter-Robot your only job is to empty the waste drawer when indicated and add litter as needed. This is the most expensive unit, but users highly recommended it for its performance and dependability. Q: How do self-cleaning cat litter boxes work? A: They use different methods but they all separate solids from the litter and deposit them in a receptacle for disposal. Q: How do I keep the litter from stinking up the house? A: Use the litter recommended by the manufacturer and run the cleaning cycle as often as needed. Q: How can I avoid problems described in some reviews of self-cleaning boxes? A: Many, if not most, problems are caused by using the wrong litter. Trying to save money by using cheap litters will likely jam up your machine or otherwise make it work improperly. Some units are very sensitive about clumping speed and hardness, and granule size. Overfilling or underfilling can also cause problems. There is usually a fill line marked on the tray to guide you. For optimal results, follow the instructions that came with your unit. What Is the Best Automatic Cat Litter Box? What constitutes the best depends on your priorities. All the units we reviewed had positive characteristics. If you prize quiet operation, the PetSafe Simply Clean is the ticket. If aesthetics rate high, the Little Robot 3 has an appealing sculptural look and works exceptionally well. The economical choice is the manually operated Omega Paw. One small kitty will do fine with the regular unit, but for two or more animals, or husky cats, choose the large. If you never want to take a stinky, sack of excrement out to the garbage again, you can flush it all away with the CatGenie. If you prefer the superior odor-control and low-dust properties of silica gel litters, the PetSafe ScoopFree Original and Ultra will keep your air fresh and the waste out of sight. We feel the popular LitterMaid is the best overall and recommend it. It is reasonably priced, and when paired with the high-capacity disposal system, requires very little work. The design minimizes odor which makes It a good choice for multi-cat households. With regular maintenance, it will last for years. All these units work well if appropriately maintained. If you read this far, you are ready to stop scooping! The only question left is which system suits you and your furry pal the best? Check them out here.